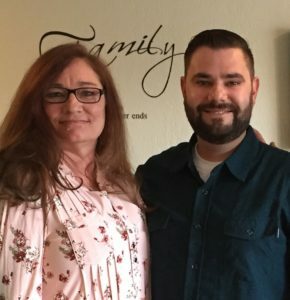 Two years after breaking up with her fiancé, Cindy became pregnant with a son. She wasn’t 100% sure who the father was, but she was his mom and that’s what mattered. Her life revolved around her son, and she worked hard to be a great mom, as well as a dad, to her child. But as he got older, the hole in his heart that was missing his father just seemed to grow bigger and bigger. The journey to learn more about Cindy & Christian’s FamilyTreeDNA story is full of surprises. 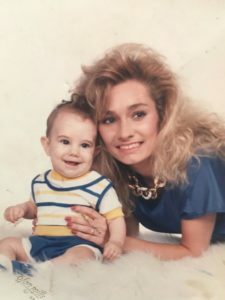 Cindy with her son, Christian. When Christian was sixteen, he took matters into his own hands. His mother told him about a store where Carl used to work. He spoke with every shop owner on the street until eventually one remembered Carl, who had since moved two hours away, and had happened to have his business card. He began making plans to see Carl who now lived in San Jose, just two hours away from where he was now living. Over the next month and a half, Christian saved every dime he could from working at the local pizza parlor to save for his trip to visit Carl, and for a paternity test that he hoped Carl would be willing to take. After sixteen years, he had to be sure. When Christian finally went to meet Carl, he was thrilled at the idea that he could be Christian’s father. Unfortunately, the test was negative. Christian was crushed, and felt that he was lied to his entire life. After confronting Cindy, she came up with another possibility. This would be the second in the list of people Christian would eventually call his “suspects.” The second suspect’s story would have an even more shocking ending. Soon after finally agreeing to take the paternity test, the man was murdered in his driveway, the victim of a jealous lover in a love triangle. Christian saw the breaking news report on television, and raced to the crime scene to try and get some of the blood for a DNA test, but was unsuccessful. A few years later, the man’s daughter finally agreed to take a DNA test to confirm whether or not Christian was her father’s son. He even agreed to sign away all rights to any inheritance he might be entitled to. But in the end, she never took the test. A third “suspect,” living an ocean away in Hawaii, also turned out to be a letdown, and Christian was giving up hope. Over the next ten years, he would take every consumer DNA test on the market, without any luck. He did his own research, looking through birth records and scouring the internet for clues. He married and had two kids, but the need to know who his father was and his heritage never disappeared. In 2017, three months before he turned 30, Christian decided to take FamilyTreeDNA‘s Y-DNA test, which explores a male’s paternal line. When he logged into his FamilyTreeDNA account which had been set up after he had previously taken the Family Finder autosomal DNA test, Christian was surprised to find a new match. A close match. An uncle. When Christian reached out, the man had no idea how they could be related. He told Christian to talk to his sister, the family historian. Upon hearing the story, the woman told Christian that the person he needed to speak with was her mother. She would be able to explain. The woman, now in her 70s, revealed that she had a baby when she was 17. Though she didn’t want to, her parents eventually forced her to give her infant son up for adoption. She never saw him again and had no idea what had happened to him. Christian knew that this woman must be his grandmother, and the adopted son must be his father. He found out the child’s birthdate, checked his records for any matches, and found he had the answer all along. Cindy had an ex-fiancé, Joe, a man she insisted couldn’t be the father because the timing was wrong. But it turned out he had the same birth date and was adopted as a baby. She couldn’t believe it and was overjoyed that the mystery appeared to finally be solved. Christian and his father Joe. 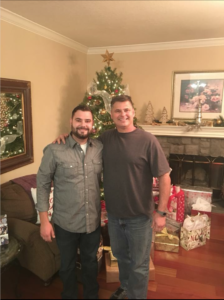 This year, thanks to FamilyTreeDNA, the pioneers in consumer DNA testing, Christian celebrated his first Father’s Day with his dad. For more exciting customer journeys like Cindy & Christian’s FamilyTreeDNA story, enjoy Jeff’s FamilyTreeDNA story.